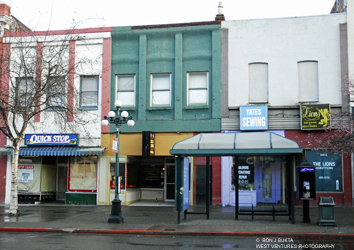 These two storefronts have a long history in Victoria. The current buildings were erected around 1888 to replace wood frame structures that had been in this site from the early days of the city. In the Colonist of September 29, 1887, John J Wilson advised “The undersigned takes this opportunity of thanking his customers and patrons for their very liberal patronage in the past, and would beg to announce that, on account of rebuilding on the premises now occupied by him, he is compelled to move, and that pending his return t his present site his bread will be kept constantly on hand and Messrs. Bossi and Geisselman’s, Mr.Jos. Wrigglewsworth’s, also at Geo Collins’ Bakery, cor. Store and Discovery sts.” When the building reopened, The Central Bakery returned to its original location and the second store front was occupied by John Partridge’s dry goods store. In 1907, when the streetcar went by, the bakery was now owned by Robert Morrison and the dry goods store was owned by George W. Robinson. Today, these storefronts are occupied by a series of small businesses.